Dallas is proud to be home of the State Fair of Texas—the most deliciously fried event of the year. In addition to attractions like Big Tex and the Midway, The State Fair boasts fried everything, from Oreos to butter. This year’s latest concoction is chicken fried lobster with champagne gravy, paired with a bacon margarita. The jury is still out on these kooky concoctions, but it’s safe to say people love treating their tastebuds to something new. Popcorn Bar: What would a fair be without the smell of fresh popcorn wafting through the air? You can bring the same atmosphere to your own event with a popcorn bar for your guests to enjoy. 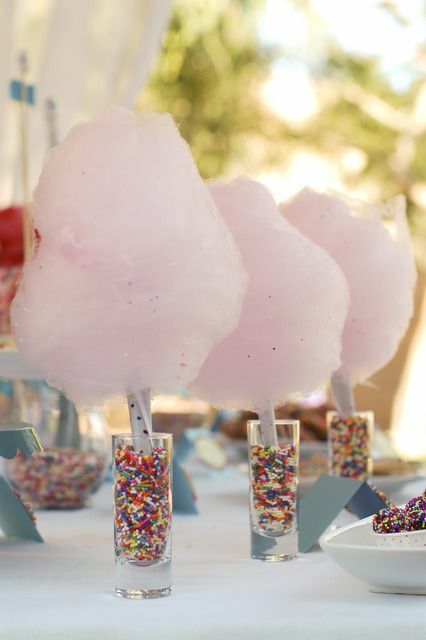 Kick it up a notch with flavorful toppings like M&Ms (color coordinated to your event, of course! ), cinnamon, and sprinkles. Corn Dogs: Would you believe these have a place at an elegant affair? Believe it or not, they’ve found their way into elite catering. With bite-size versions of this State Fair classic, you can deliver guests an hors d’oeuvres platter they’ll love. For a surprising twist on flavor, serve these delicate bite-size appetizers with a dainty dollop of raspberry jam. Grown Up Mac N Cheese: This is a tried and true favorite at Gil’s. Cater to your guests’ inner kid with this childhood classic, taken to a whole new level. Whether you top this cheesy concoction with brisket or fried chicken, grown up mac n cheese is sure to be a crowd pleaser. Signature Drinks: We can’t promise everyone will enjoy a bacon margarita. But we’re willing to bet your guests will love the chance to taste a unique signature cocktail at your wedding or event. Ask your event caterer what kind of mixed drinks they can whip up for your special occasion. Don’t forget to give it a personalized name! Even if you aren’t serving alcohol, your caterer can provide you with plenty of options for non-alcoholic drinks that will wow your guests. After all, who doesn’t love ending the night on a sweet note with milk and cookies? Food Stations: Bring the entertainment of the fair to your own event by hiring food stations where guests can watch the chefs at work. Whether carving a brisket or flipping grilled cheese, a chef in action adds bonus entertainment value to delicious food. As Dallas event caterers, we draw inspiration from our hometown’s State Fair and transform carnival concoctions into delectable treats customized to your special occasion. What kinds of nontraditional foods would you like to see at your next event? We would love to work with you on a custom menu—just get in touch so we can start planning an event as delicious as the State Fair!